In 1818, my x3 great grandfather John RIDOUT married for the second time. He and his wife Martha stayed at 4 Kirkham’s Buildings in the village of Bathwick and over the next few years their children were born: six sons and a daughter, most of who would survive well into adulthood. Five of these children were baptised at the Countess of Huntingdon’s Chapel, which is in the Vineyards at Bath. The building has been renovated and now houses the Building of Bath Collection, which is well worth a visit. The children’s baptisms were the first indication to me that John was a non-conformist, or maybe this was Martha’s influence since Sarah’s children had been baptised into the Church of England. Selena Hastings, Countess of Huntingdon, built many Methodist chapels across the country, which she called her ‘Connexion’. 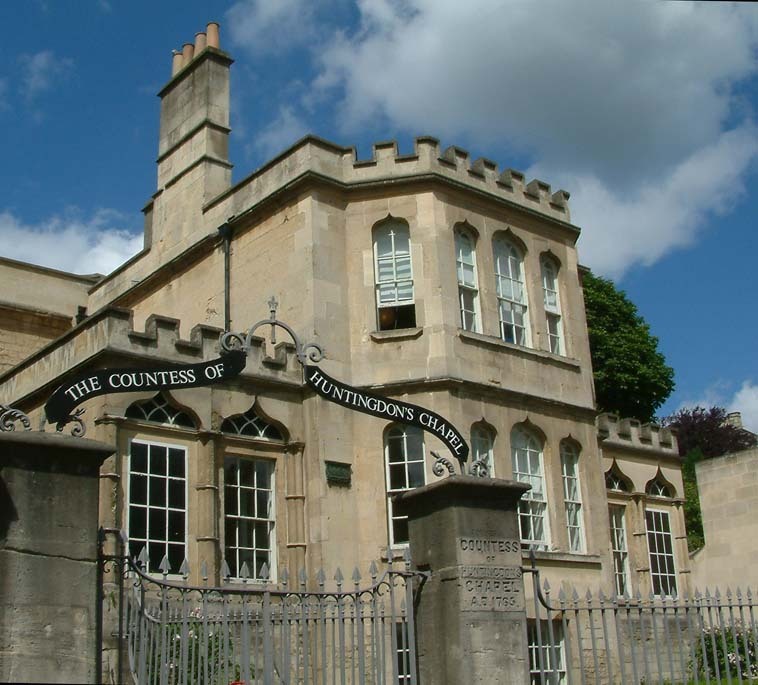 The Countess had seen the dark side of Bath’s genteel society: depravity, crime, licentiousness and immorality. With evangelical fervour she sought to save the fallen. As a lady of considerable social standing, the Countess probably hoped to lure the aristocrats of Bath to her chapel but, perhaps inadvertently, she created a fashionable place of worship with a devoted following amongst the socially aspiring lower orders. John and Martha were certainly not well off, but were, perhaps what might then be considered as ‘lower middle class’. For whichever reason was important to them, John’s family worshipped at the Chapel and, over the years, his children were baptised into the Methodist religion. John remained at Kirkham’s Buildings until a point just before January 1824, which is when his rate book entry is scored through. I noticed that when John’s son Charles died in January 1827, the entry in the parish register showed the family address to be ‘Bristol Road’. An examination of the rate books for that area showed that in October 1824 John was a tenant of 18 Upper Bristol Road, paying an annual rent of £28. But by May 1830, John’s entry in the rate book was again pencilled through and, as he had paid none of his quarterly rate of fourteen shillings, he had probably moved out of the house. The 1841 census of Bath had recorded John at 4 Trinity Street in Kingsmead and so I took a look at the rate books and found that in May 1830, in Trinity Street, the entry for ‘Mr Morgan’ was substituted with the name ‘John Ridout’. To start with I couldn’t figure out where number 4 was until I paid a visit to the local record office and looked at their map collection. 4 Trinity Street (arrowed). Cotterell map 1853. 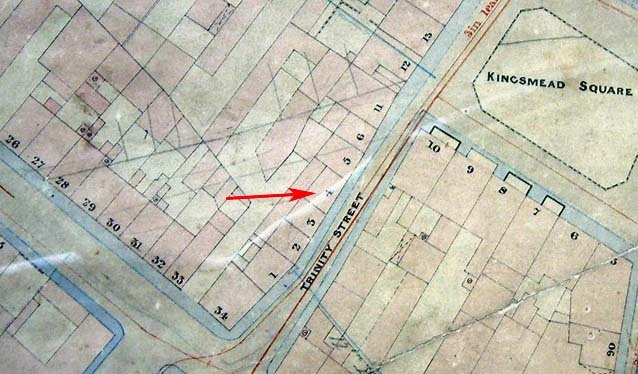 Cotterell’s 1853 map (right) shows a rank of houses standing opposite to those few that are left in Trinity Street today; they had been pulled down to make way for the construction of New Street, the proposed route of which is pencilled in on the map above the red arrow. In 1832, John Ridout voted in the first Bath election and was recorded as the tenant at number 4. The Reform Act of 1832 was a result of much widespread and vociferous discontent with the unfair electoral system. The rumblings had turned to riots, such as those in Bath and Bristol which John’s brother-in-law, William Henry SOMERTON, had so vividly described in his newspaper. John was not a landed gentleman, he was an ordinary working man, but the right to vote had now been granted to those who owned a property or paid more than £10 a year in rent; John paid £24 for his house and workshop so he was one of the few who had the ‘privilege’. Possibly as few as one in seven men in Bath would have had the vote and so perhaps this says a little about John’s financial and social standing. Looking at the censuses over the decades indicates that number 4 was a large house, at one point with as many as eighteen people living there. During John’s tenancy he and his family occupied most of the house themselves and rooms were let to a couple of young men. In 1837 Martha, at the age of 45, had Joseph, perhaps named after her father, Joseph Somerton. The poor little chap died of typhus fever when he was just two. By 1840, both Martha and John’s second son Henry had died; she of ‘inflammation of the lungs’ and he of ‘dropsy’. John was once more on his own with the children. This entry was posted in General, Individual and tagged Bath, Countess of Huntingdon, Family history, Martha SOMERTON, Methodism, Rate books, William Henry SOMERTON. Bookmark the permalink.